ATLANTA–It was a star-studded Saturday night in Atlanta that saw six players and one coach inducted into the Black College Football Hall of Fame. Players who solidified their fame through stellar careers in the NFL paid homage to their HBCU roots. 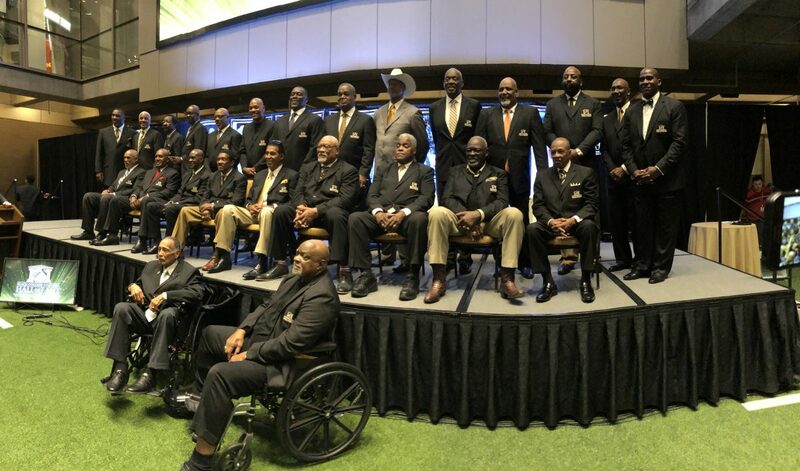 The Class of 2018 included Harold Carmichael (Southern), Raymond Chester (Morgan State), Thomas “Hollywood” Henderson (Langston University), Leo “Lincoln Locomotive” Lewis (Lincoln), Greg Lloyd (Fort Valley State), Everson Walls (Grambling State) as player inductees and Coach Bill Hayes (Winston-Salem State and North Carolina A&T). “It’s the highest honor of my life, I didn’t play long enough to be in the NFL Hall of Fame. But I played good enough at a Historically Black College and University to be put on a team with some real legends of football. We are moving to Canton so we’re going to be in the same building and parking lot, so Hollywood Henderson is going to make it to Canton. It may not be the conventional way but I’m going to Canton,” said Langston alumn Thomas “Hollywood” Henderson. Going into the Hall meant putting on the famed “Black Jackets” and joining some pretty elite company. Doug Williams is a 2011 inductee and one of the co-founders of the Hall of Fame. “That’s what this Black College Football Hall of Fame is all about, giving guys their flowers that are due their flowers,” Williams said. Current collegiate and NFL players also received awards on Saturday. Amir Hall from Bowie State University beat out Trent Cannon (Virginia State), DeVante Kincade (Grambling) and Lamar Raynard (N.C. A&T) for the top college player of the year. Hall added the Deacon Jones Trophy to his collection of hardware from last season that also includes the HBCU Gameday Offensive Player of the Year. Howard alum Antoine Bethea, and current Arizona Cardinal, was the winner of the inaugural Pro Player of the Year Award. Saturday’s event was held in downtown Atlanta at the College Football Hall of Fame in front of a packed house. The festivities will soon be heading north, however. The new Hall of Fame facility is set to be completed in 2019 in Canton, Ohio.